A line of over 100 people waiting to get their hands on a free, fluffy pita sandwich on opening day. Giving an exclusive sneak peek of beautiful diamonds and jewelry to prominent influencers in Columbus. Inviting local dignitaries and media to a new restaurant that will create jobs and spur the local economy. From restaurants to co-working spaces to jewelry stores and more, we’ve had the honor and privilege of working with clients on creative and newsworthy grand openings that go above and beyond. You name it, we’ve covered it. Not only are grand opening events an opportunity to showcase a brand’s identity and mission to an important group of people, but it also provides an ideal “moment in time” for a brand or organization to create news and secure media coverage that will live well beyond opening day. Think of it as a way to lay the foundation for your business and create a great reputation and profile from day one. Identify Your Identity: So many new businesses open each and every day. What makes yours different and unique? You’ll want to make sure that you can answer this question seamlessly when asked by any of your various stakeholders. We recommend developing a look, feel and overall tone for your brand, along with accompanying key messages that help you clearly define and discuss your brand. While these may take some time to develop, they will certainly pay off in the long run. Community Connection: Whether or not you decide to have a grand opening party, one thing is very important to remember: connecting with your community is key. Make sure that you get out there and connect with residents, small businesses and others who can come in and experience everything you have to offer. Maybe it’s inviting some neighbors to come in and taste a few items on the house before your restaurant opens. Or, maybe it’s giving another small business an inside peek and tour of your space before it is open to the public to discuss possible partnership ideas. Word of mouth plays an imperative role in the success and growth of a business, so make sure you foster and continually nurture those relationships. Meet with the Media: Local newspapers, radio stations and local online sites are viewed as a connection to the community, giving locals a real-time look at news and happenings. Make sure that you (or your agency) reach out to media to give them an exclusive look at your space before it opens. Make contact with community editors and assignment editors, providing them with a full media alert that showcases the who, what, where, when and why of your new business. Securing media coverage for an opening is a big win—and is something you can share and promote for months to come. channels, whether it be through creating a handle or pursuing digital advertising. One word of caution: If you do plan to “get social,” make sure you have the time and resources to ensure your accounts are always up-to-date and relevant. A social channel that falls to the wayside and isn’t updated will decrease your brand’s credibility and may negatively affect your business. Influence the Influencers: In addition to connecting with local community members, take it one step further. Are there influencers in your community that you think would serve as great ambassadors for your business? Do some digging and see if there are any bloggers or Instagram influencers (in your community or perhaps in a feeder market) whose content and identity matches yours. Then, reach out and offer them an opportunity that they can’t pass up in exchange for coverage on their social channels. These influencers often times have very loyal followers who can hopefully become an advocate of your brand, too. It’s important to note that some influencers will require compensation for promoting your brand, so make sure to carve out some budget just in case you need to use it. Our last thought on grand openings? Try not to have the mentality of “build it and they will come.” It takes a lot of effort, creativity and strategic thinking to execute a grand opening and sustain a business. After your grand opening, continue to think of ways to build advocacy, create interest and ultimately drive traffic and sales. Your grand opening is just the first step on your exciting journey—but, if you do it right, you’ll be off to a GREAT start! 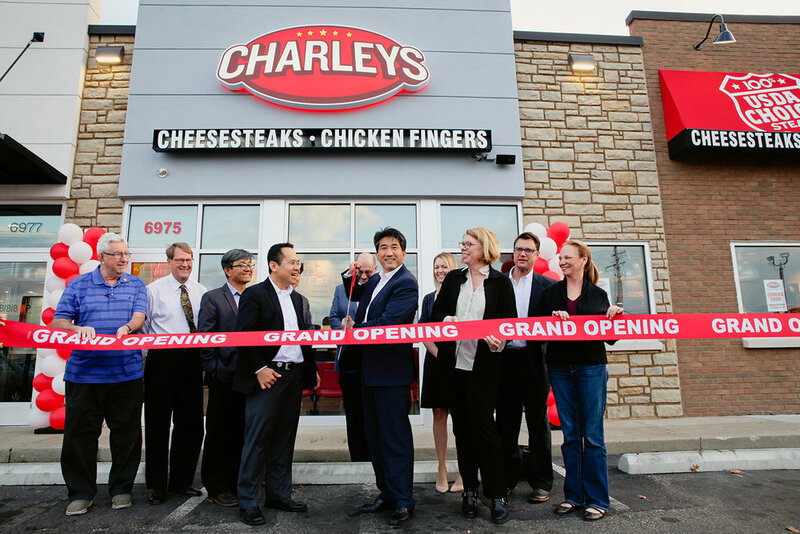 Check out the great case study we’ve put together on a Charleys Philly Steaks grand opening that really moved the needle and created a great first impression for the brand in a new market. And, check out this Eventbrite article that talks about some ways to make a big splash at your own grand opening event. Want to learn more about marketing your next event? Let’s talk. Approach us anytime at hello@approachmarketing.com.